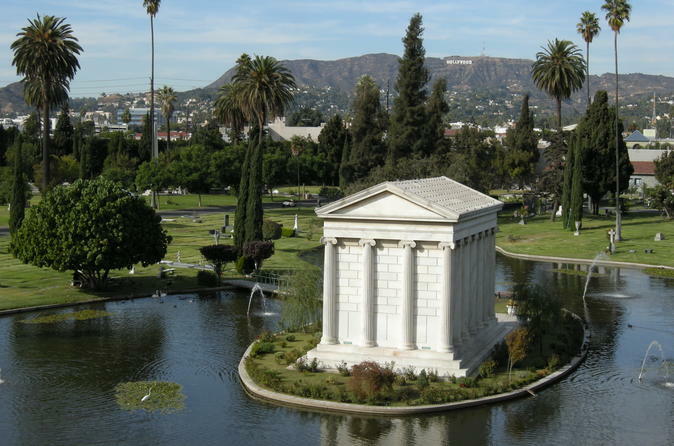 Come learn about the historic tales, scandals and mystery that make Hollywood Forever Cemetery one of the most fascinating locations in Los Angeles. Come visit legendary notables such as Cecil B. Demille, Marion Davies, Tyrone Power, Rudolph Valentino, Vampira, John Huston, Carl "Alfalfa" Switzer, Mickey Rooney, Judy Garland and more. It is a great overview of the cemetery and its most famous residents. Hollywood Forever Cemetery is one of the most celebrated and intriguing locales in Los Angeles. Since 2002, historic tour guide Karie Bible has been giving official walking tours of the property. This tour has been one of the city’s best kept secrets--until now. The 2 1/2 hour tour highlights the various historic tales, scandals and mysteries that remain a part of Hollywood lore. The tour begins with an introduction that focuses on the diversity of the cemetery and how it has evolved over the past several decades. Attendees then take a journey around the pond and into the life stories of numerous luminaries, including Griffith J. Griffith, who gave the city Griffith Park--and in 1903 gave his wife a bullet to the head. Surprisingly she survived the attack and Griffith served only two years in San Quentin for the crime. Showbiz names on the tour literally run the gamut from A to Z, with award-winning director John Huston being only feet away from Maila Nurmi, known to the world as "Vampira" from Ed Wood¹s "Plan 9 From Outer Space." Legendary director Cecil B. De Mille also rests only a short distance away from bit player Virginia Rappe, whose only fame came through her death days after Roscoe "Fatty" Arbuckle's ultimately tragic weekend party in San Francisco. Other stars featured include Fay Wray, Janet Gaynor, Cecil B. De Mille, Marion Davies, Tyrone Power, Mickey Rooney and Columbia Pictures founder Harry Cohn. The tour also includes "cenotaphs" or memorials for stars whose remains are interred elsewhere including Jayne Mansfield and Hattie McDaniel. Later the tour explores the Cathedral Mausoleum, which houses silent screen star Rudolph Valentino. According to tour guide Bible, "In all of the years I’ve been giving this tour, his grave remains the most popular and asked about one in the entire cemetery." The Cathedral Mausoleum also includes slain film director William Desmond Taylor and actors Peter Finch and Peter Lorre. After the Cathedral Mausoleum, the tour visits the newly installed cenotaph for “Toto” the canine star from The Wizard of Oz and the grave sites of Douglas Fairbanks Sr. and Jr., Carl "Alfalfa" Switzer, "Golden Girl" Estelle Getty and Mel Blanc whose grave fittingly reads "That¹s All Folks!" The tour ends with a visit to the legendary Judy Garland who remains the greatest all around entertainer in the history of show business. Appropriately, Karie was born on Halloween night, has two different colored eyes and a very pale complexion which helps to make her a perfect host for an afternoon of walking among crypts. In an effort to evoke old Hollywood glamour, she even gives the tour in a black vintage gown and matching parasol, which makes her a living photo op for tour guests wanting to remember their adventure at Hollywood Forever.